Red-Fern Media is a thriving HubSpot marketing agency that’s going from strength to strength. The business needed a reliable provider of high-quality content to support Red-Fern’s delivery of HubSpot marketing strategies and secure the best return on investment for its clients. Incredibble got in touch to offer copywriting services and now the agencies work hand-in-hand to deliver a range of projects based on best-practice Hubspot strategies. With the right processes in place, and with the resource to take on more projects, Red-Fern Media continues to expand. Red-Fern Media helps businesses grow by providing a full suite of digital marketing services including analysis, strategy and the delivery of digital, social and inbound plans. They also design and develop websites and custom software based on strategic design and development. All too often, Red-Fern would create a website blog page only for it to remain empty. They knew the value that high-quality SEO copywriting could bring and wanted a content partner that could align with their wider marketing plans. Red-Fern knew they could offer more if they had the right team in place. The agency already had a writer and a number of freelancers available to help them turn projects around. But they needed to bolster their team to ensure they could deliver, no matter how much work came in. Incredibble sent Red-Fern a good old-fashioned letter showcasing the team and its white-label service. Red-Fern were instantly attracted by the quality of the team’s work and the obvious understanding of HubSpot’s content strategy. As critical parts of HubSpot’s inbound methodology, this was an exciting proposition. Red-Fern also felt Incredibble would be a great fit due to the warm, professional and open approach of of Incredibble’s founder, Helen Dibble. The relationship began by engaging Incredibble to write Red-Fern’s own content: this gave the agency the opportunity to see the team in action and establish effective working processes. Red-Fern liked what they saw and were soon using Incredibble to deliver work for their clients. In the past, Red-Fern had been highly involved in the process of time-consuming website content creation. It also took their specialist web developers away from where they added most value. Thanks to the high level of client service that Incredibble provides, both agencies work closely together to ensure Red-Fern’s marketing insights are implemented in client copy. By bringing in Incredibble’s copywriting expertise, Red-Fern could be certain they were delivering the best outcomes for their customers. Every piece of content – be it for websites, blogs, whitepapers or other marketing collateral – is high-quality and naturally includes the required keywords at the right density. In fact, the results have been so good that Red-Fern no longer works with any other freelance copywriters. To extend your HubSpot agency team with a tried and tested content agency, get in touch with Incredibble today at helen@incredibble.co.uk. You want to write; you know all the benefits for your business in writing compelling content; you’ve even scheduled the time to do it. But putting pen to paper – or fingers to keyboard – is proving difficult. Writer’s block? Or plain old punctuation panic? Don’t let the fear of an incorrectly placed semicolon prevent you from elevating your marketing to the next level. It is entirely possible to write creatively without being a punctuation puritan, but as the purpose of good punctuation is to create clear copy, knowing the basics is critical to avoid weakening your message and losing customers to whom good grammar matters. As Sue Shellenbarger, writing for the Wall Street Journal, says: “looseness with language can create bad impressions with clients, ruin marketing materials, and cause communications errors”. So, with the help of Incredibble’s very own grammar guru, Lucy, this short blog will take you through the basics so that instead of being a pain in the proverbial, punctuation makes your writing flow, and your customers engage. Anyone who has read ‘Eats, shoots and leaves’ by Lynn Truss knows all about the sentence-changing ability of a misplaced, or more often, missing comma. The most common punctuation mark, and therefore the most commonly misused. There are many, many rules surrounding comma usage. Even Lucy calls them ‘a tricky beast’. They should be thought of as short pauses, or a breathing space in a sentence. They should also, amongst other things, be used between items in a list. Simple? Not simple. In lists beware of the Oxford comma. This academically named mark is the last comma in a series which comes before ‘and’ or ‘or’. Such as “I need a dark room, cold compress, and a glass of wine”. The good news is that they are a POINT OF STYLE. Which means you can take them, or leave them: in general, commercial copy/media writers don’t use them. One to score off the list. And talking of style, what about the comma splice? The punctuation phenomenon where you use a comma instead of a full stop between two independent sentences. Such as “It’s nearly 6 pm, we won’t reach the shops before they close”. In the English language, its usage is considered as gauche in style terms as Trump wearing a mismatching suit. Just don’t. 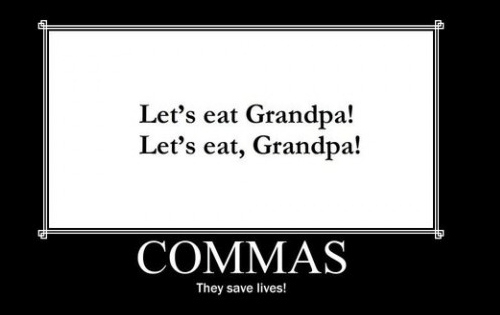 Use two separate sentences or a conjunction after the comma. A semicolon is also used to create a pause in a sentence. Described in the Guardian Style Guide as “a very elegant compromise between a full stop (too much) and a comma (not enough).” Lucy is a lover of the semicolon when it is used correctly to narrow the gap between two closely linked sentences. But I must say I have a great respect for the semi-colon; it’s a useful little chap. It has its detractors though, who deem it a bit academic or highbrow. So, use with caution, and know your audience. And definitely don’t use it when you should really be using a colon. A colon can be used in many ways. It often gets substituted with the semicolon when it is inserted between two independent clauses or sentences. However, a colon is used where the second clause explains, illustrates, paraphrases or expands on the first. It also introduces quotations and precedes a list or series of items. It is NOT interchangeable with the semicolon. I think Lucy is happy with that explanation: she has a big smile on her face. If you check out your laptop keyboard, you will see no less than three horizontal markings, of varying lengths, with which you can liberally season your writing to give it added meaning. These are called the endash, emdash and hyphen. The longest – and a personal favourite of mine – is the emdash. This can be used in place of a comma or parentheses to create a break in sentence structure and is often used for emphasis – it’s a versatile little fella. An endash, on the other hand, is used to connect values or ranges. Hyphens are critical to the understanding of many sentences and are used to join words that are logically connected. Again, a useful device changing: “Beware of man-eating tiger” from a lifesaving warning to “Beware of man eating tiger” an exotic sounding menu item. So, some of mine (and Lucy’s) favourite punctuation marks for you to consider and digest. The world of grammar and punctuation is a big one but so critical in making your writing standout for the right reasons – POP! Don’t let fear of using them stand in the way of boosting your business’ profile. To learn more about writing impactful content to promote your business sign up to ‘An introduction to business blogging’ where I’ve put together my best time-saving and article building techniques into one 60-minute, fun easy-to-follow course. I’ve even thrown in my favourite grammar tips and Power Word dictionary to help you on your way. Find out more here.